With only a few weeks remaining before Floridians cast their vote for governor, Democratic gubernatorial nominee Andrew Gillum is involved in some Broadway show Hamilton fuckshit. The Times also notes that records show that the “friend” also provided Gillum and his brother with a hotel room once he arrived in New York and may have paid for a good portion of a vacation that Gillum shared in Costa Rica. Gillum allegedly never reported any of the gifts, and that may be because he believed that everything was above board. Gillum claims that the tickets were gifts from his brother but text messages contradict this. Text messages included in the package show that Mr. Corey wrote to the mayor on Aug. 8, 2016, about plans to attend the show in New York. Also attending would be Mr. Gillum’s brother, Marcus, and the three F.B.I. agents posing as businessmen, one of whom identified himself to the others as Mike Miller. “Mike Miller and the crew have tickets for us for Hamilton tonight at 8 p.m.,” Mr. Corey wrote. “Awesome news,” Mr. Gillum responded. The texts appear to dispute Mr. Gillum’s claim made days after his surprise win in the Aug. 28 primary for governor that the show ticket had come from his brother. A gift from a family member would not have triggered state ethics rules for public disclosure. Geoff Burgan, a spokesman for Mr. Gillum’s campaign, said on Aug. 31 in response to written questions from The New York Times that Marcus Gillum had given the mayor the ticket. The campaign subsequently released receipts from the New York trip, but said that no receipt for “Hamilton” was included because the mayor had thought the ticket originated with his brother. But Gillum’s people have a clear explanation for all of this. Gillum has strongly stated that he’s not under F.B.I investigation nor is his city. In a statement to the Times, Gillum noted that all of this is a political sideshow and doubled-down on the claim that it was his brother who’d obtained the ticket as it was his brother Marcus who handed him the ticket at the theater. Gillum took his message surrounding Hamilton-gate directly to the people, declaring his innocence on Facebook. “These records vindicate and add more evidence that at every turn I was paying my own way or was with my family, for all trips, including picking up tickets from my brother, Marcus, who was with a group of his own friends,” the campaign said in a statement, CNN reports. “When I got there after work — got my ticket, went in and saw it, assumed my brother paid for it and so far as I know that was the deal,” he continued. In their CNN debate Sunday, Gillum’s Republican challenger for governor Ron DeSantis questioned Gillum about the source of the tickets and who paid. “Did you pay for the ‘Hamilton’ ticket, or did the undercover FBI agent pay for the ‘Hamilton’ ticket?” DeSantis asked. Gillum noted that he’s always paid his own way. 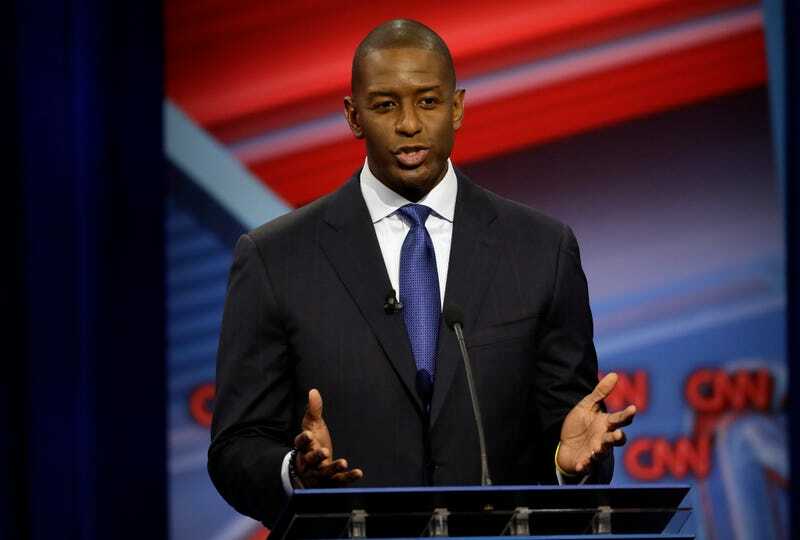 “We all have friends that sometimes let us down,” Gillum said. First off, it’s Hamilton so I totally understand. While the Hamilton hype may have died down now, in 2016 when all of this alleged skullduggery took place, Hamilton tickets were peak niggadom. Yes, a musical was the flyest scene at the time. People were offering to trade their newborn infants on eBay get tickets, so I get it. If someone came through with some Hamilton tickets in 2016, you aren’t really trying to question where the tickets came from. Also, this story feels a lot like the classic Doobie Brothers episode of What’s Happening which now makes me think that someone in Gillum’s crew may have been forced by goons to carry a VHS camcorder to record Hamilton. The real question that needs to be answered here is: Which Hamilton you be-amilton?